“When am I scheduled to be in court? AgencyWeb Mobile is a native application that provides registered users the convenience of mobile access to their AgencyWeb IWM account. With AgencyWeb Mobile, employees can complete daily administrative and scheduling tasks while on the go. Personnel using AgencyWeb Mobile can view their assignments and scheduled events in daily, weekly or monthly calendar formats. By simply tapping on any date, employees can easily view details about their shift. Supervisors can quickly search for and call other employees to back fill vacancies. The ability to request time off or overtime is right at your employee’s fingertips -- whenever and wherever it’s needed. What about sending court notifications to officers in the field? We've got that covered too. 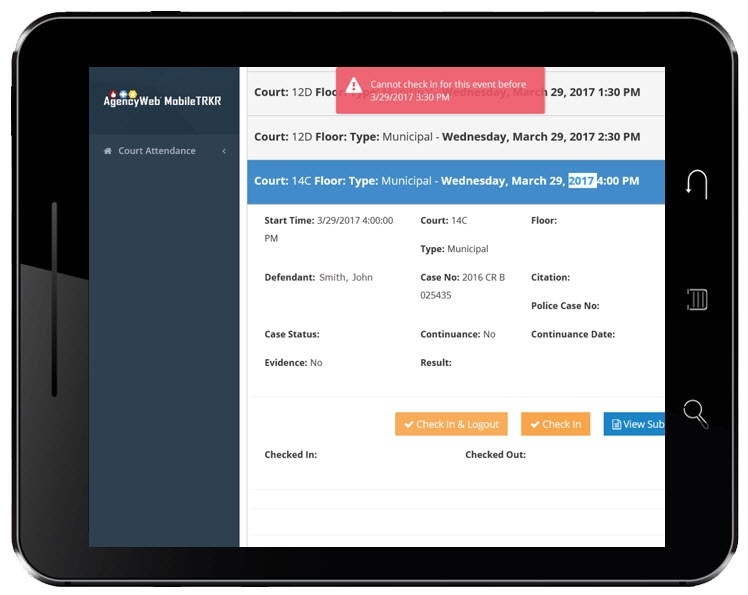 With AgencyWeb Mobile officers can receive and acknowledge court subpoenas directly from mobile devices - and conveniently view all events on their calendars. Employees using AgencyWeb® Mobile view agency announcements in real-time. These can range from general announcements to specific notices sent to targeted groups, such as shift-related BOLO’s or CAD incidents. AgencyWeb® MobileTRKR is designed to track employee attendance that is unique for public safety... from firearm range certification sessions, to volunteer station attendance, to court events, training and on-call rapid-response arrivals and departures. Rules can be applied to ensure that personnel are not checking into events too early, or remaining too long after events have been completed. If mobile devices are preferred, geographical location data can be applied to ensure that logins/logouts are within close proximity of scheduled events.